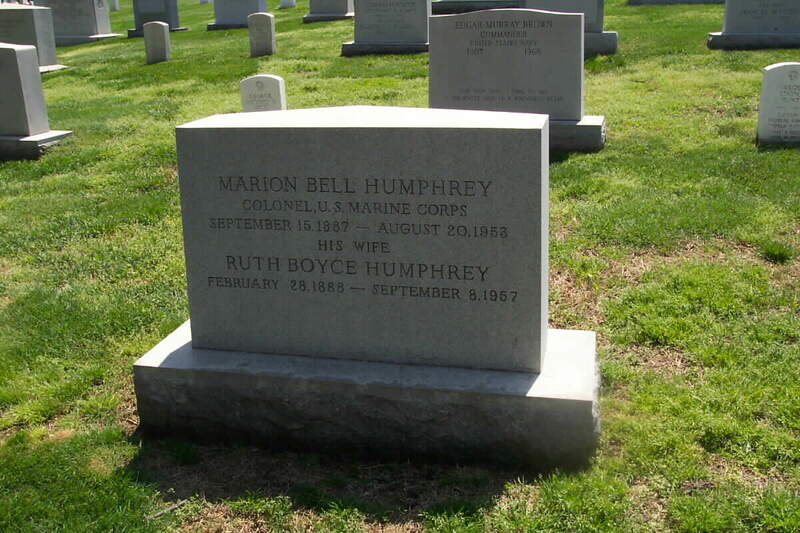 Marion Bell Humphrey died at Bethesda Naval Hospital, August 20, 1953. A veteran of 35 years on active duty with the US Marine Corps, he was decorated by 3 foreign governments during his services in the Caribbean and in Europe. He left active duty December 1, 1944, and since then has lived at 2022 Columbia Road, N.W., Washington, D.C., with his wife, Ruth, who survives him. He was commissioned a Second Lieutenant October 2, 1909, and reached the rank of Colonel in 1938. His funeral will be conducted by Gawler's Funeral Home, 1756 Pennsylvania Avenue, NW, Washington, DC, with burial in Arlington National Cemetery. He has been awarded the Haitian Distinguished Service Medal and the Diploma, Nicaraguan Medal of Merit, and the Award of Holy Order of the Redeemer, Class I, by the Greek Government, in addition to the US Mexican Service Medal, the Haitian Campaign Medal, the Dominican Campaign Medal, the Expeditionary Medal with 1 bronze star for Haiti, 1916, and Cuba, 1917, World War I Victory Medal with Aisne, Aisne-Marne, St Mihiel and Meuse-Argonne battle clasps, and the Second Nicaraguan Campaign Medal. He was born at Cheyenne, Wyoming, Sep 15, 1887. He attended the Army and Navy Preparatory School in 1907-08, and a law course at George Washington University in 1908, before entering the Marine Corps. He graduated from the Army War College in June 1933. Two of his brothers are Army General Officers. They are (as of 1950) Brigadier Generals Evan H. Humphrey and Charles F. Humphrey. He was retired early in WWII for medical reasons, but remained on active duty for some time. He and wife, Ruth B. Humphrey, live at Wyoming apartment hotel, 2022 Columbia Road, Washington, DC. A veteran member of the Marine Corps Reserve Examining Board, US Navy Retiring Board, and US Navy Examining Board, Colonel Humphrey was transferred to the Corps retired list on July 1, 1942, but continued on active duty. He was commissioned a second litutenant in October 1909, First Lieutenant in October 1916, a Captain in June 1917, a Major in January 1924, a Lieutenant Colonel in Nov 1934 and a Colonel in July 1939. Medals: Haitian DSM, Nicaraguan Medal of Merit (with silver star), Holy Order of Redeemer, Class 1, by Greece in 1928, Mexican Svce Medal, Haitian Campaign Medal, Dominican Campaign Medal, Expeditionary Medal (with bronze star), Victory Medal (with Atlantic Fleet clasp), Second Nicaraguan Campaign Medal, various letters of commendation. In 1917, he was in command of the Marine Detachment aboard the USS Oklahoma. During other periods of sea service he was aboard USS Prairie, Virginia, Rhiode Island, Pittsburgh, Tennessee, Montana, Levithan, Henderson, and President Harding. An expert with small arms, he trained the Marine Corps rifle and pistol teams in 1920. He served as Captain of this group in 1923, 1927, and 1928. He was in Europe in 1925 as aide on staff of the Force Commander, US Naval Forces, and also as intelligence officer. He spent 1926 in the US, serving as Chief of Staff, Eastern Mail Guard. During the Second Nicaraguan Campaign he served as Chief 0f Staff, Second Brigade. September 15, 1882-August 20, 1953. 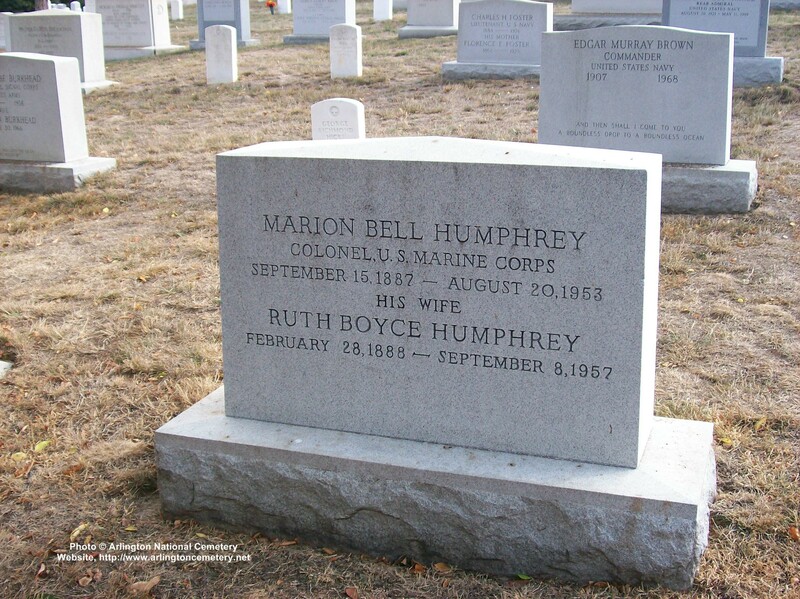 He is buried in Section 4 of Arlington National Cemetery with his wife, Ruth Boyd Humphrey (February 28, 1888-September 8, 1957). 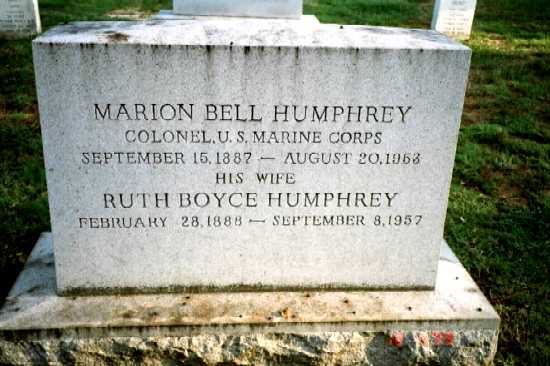 His gravesite is near that of his father, Major General Charles Frederick Humphrey and those of his brothers.